Just enter your e-mail and click. We do not sell or share e-mail addresses. The newsletter this time is a double duty as I am sending a more streamlined version through the email--with the suggestion to click the link and come here to get full impact of this newsletter. Our reader's profile is Wendi on Cheyenne. Sadly Wendi lost Cheyenne recently, so this is a memorial to her and a way to let Wendi know that we share her grief. The Featured Website and the article are connected and involve the wild horse and burro situation. Please read with an open mind, considering all sides of this issue. Now for the funstuff. We sponsored a story writing contest and three young ladies have won beautiful horse posters, and a great big thank you from me for their sharing their creativity. Their stories are printed on the For Kids Who Love Horses page. Congratulations to Christine, Rachel, and Mel! Also, I want to thank Jenna for her kind letter stating that she enjoys the newsletter and that she is getting back into riding! I wish I could be there to share her fun! subscribed to Learn All About Horses. Letting a horse graze while wearing a breast collar can be dangerous. The breast collar can restrict the air or bloodflow to the brain and the horse can pass out! I have witnessed this happen to the detriment of the pickup door that the poor horse fell into. The horse regained consciousness immediately and was fine. A tribute to a mare who died. Located on Subscriber Contribution page. 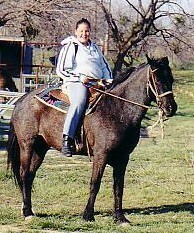 This is Wendi on Cheyenne. Cheyenne was killed in tragic accident not long after this picture was taken. She is very much missed and was chosen for the reader's profile as a memorial to her and to the young lady who loves her. Wendi loves horses and loves to ride. This picture was taken on the Ft. Griffin Trail Ride (that's in Texas), a two-day overnight ride that presents different and interesting challenges each year. Wendi is experienced at camping with people and horses. And with a smile like that, she has to be fun to be around! This article might be a little controversial, but it is information that needs to be considered. Please read with an open mind. It's the only way we can help. 3. What is Coggin's Disease? Go to Articles and Information to read above articles. Our featured website this month is The LIFE Foundation. This site is a wild and abused horse rescue site that offers a world of information on wild horses and burros, as well as very sound counsel on adopting and caring for horses. Due to the untimely death of its founder, this site is no longer active, but the information remains in tribute. It is well worth visiting. Contest Results and Winning Stories! Tell a friend about us with Pass-It-On! Need a second income? Want to stay home with the kids? Tired of being scammed? Click here for more information. activities. Post your event; see what's happening.